Following the cornet, the euphonium is a significant instrument in the traditional British brass band, and there have been many successful solo musicians on this instrument. 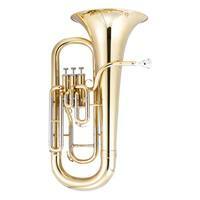 You can also find the euphonium in Wind Bands and occasionally in orchestras, making it quite a versatile instrument. Euphoniums in many respects are similar to the Baritone horn, both playing in the key of Bb. But while the baritone horn has a cylindrical bore meaning that the bore stays mostly the same size until the bell flare; the euphonium has a conical bore, with the tubing getting larger all the way through the length of the instrument which gives the players a darker tone than the baritone horn. Many euphoniums players actually start learning to play on a baritone horn due to its small size and as both instrument use the same type of mouthpiece it is easy to transfer at a later stage. Mid range euphoniums have 4 valves and come in two basic types, non-compensating and compensating. Compensating instruments have extra ‘knuckles’ of tubing which ‘compensate’ for the tendency of the low register to be sharp. This extra tubing lowers the pitch to help bring the lower notes closer in tune. With the additional tubing comes additional weight, however. The 4th valve is positioned on the side of the instrument and played with the left hand which gives the player access to the lower register as when engaged it increases the instruments range by 2 ½ tones downwards. Learning a musical Instrument at a young age has a whole host of benefits but it is important that children are comfortable holding and playing their instrument before they start their musical journey in earnest. Even the three valve euphonium is a relative big instrument so it is often better to start with the baritone which is very similar but a little smaller. The other consideration for younger players is their ‘embouchure’ or mouth position when starting at a young age. Developing a good embouchure can take many years and relies on making small adjustments over time. It is usually best to wait until adult teeth are fully in place so that a stable mouth and teeth position is set for players to use as their baseline for embouchure development. The euphonium’s bore is conical or cone-like in shape which increases in diameter down the length of the instrument. This give the euphonium a much warmer and softer sound when compared to the baritone horn. Most euphoniums have a bore measuring between 14.5mm and 16.8mm. A smaller bore is usually characterised by a tighter, brighter tone. Like the majority of brass instruments, smooth performance for your euphonium’s valves is vital. Sticky or seized valves are a common issue with cheaper student instruments so be sure to check these carefully. Learning how to correctly oil your instrument’s valves will also be invaluable in reducing these kinds of issues. Valves on student euphoniums tend to be nickel-plated. These are hard wearing, durable and perform well without frequent maintenance. Higher standard euphoniums may be fitted with Monel valves which although capable of a higher standard of play, will require more frequent maintenance as they are softer when compared to nickel-plate. However, Monel valves are corrosion resistant so tend to have a longer overall lifespan. Bell Bell size and material have a significant effect on the sound of your euphonium. A larger bell will project your playing more effectively and over a wider area at the same level. The material that your bell is made from also makes a significant different to the tone of sound that you produce. See the ‘material’ section for further details. These components make holding your instrument more comfortable and help you make small tuning adjustments. These allow moisture to be easily drained from your trumpet and if used regularly can help increase the lifespan of your instrument. Traditionally Brass tends to be the most common material that euphoniums are constructed from. A number of different types of brass are commonly found usually differentiated by the ratio of copper to zinc. Yellow Brass is most commonly found on student models and has a copper content of about 70% (30% zinc). High grade 80:20 brass becomes more common in step-up and more professional standard models. Rose, or red, brass has the highest copper content at about 90% and is capable of achieving a warmer, mellower tone more easily. Rose brass can sometimes be found in the construction of some leadpipe and bell sections on student euphoniums. This can support the swift progression of newer players and also has the advantage of resisting ‘red rot’ and corrosion. The JP074 is a high quality Bb student euphonium with an open wrap design and thumb hook to support players with smaller hands. constructed from yellow brass throughout with the inclusion of a rose brass leadpipe providing a full, dark sound. A .571" bore, 11" bell and open wrap design help sound projection and support those students that are new to the instrument. The JP174IL is a durable non-compensating Bb student euphonium with 4 inline valves, giving access to the lower notes without the extra weight of a fully compensating system. The inclusion of a rose brass leadpipe enables players of all standards to achieve a full, rich sound whilst its 11" bell gives good projection. Constructed from yellow brass throughout and with a .661" bore, 11" bell and bottom sprung valves for a smooth and free action. A bell ring is also included providing a robust and rigid construction. The JP274 MkII is a high-performing fully compensating Bb euphonium suitable for serious students and musical professionals alike. The JP274 MkII features a fully compensating system enabling players to more accurately tune their playing. The instrument also includes an 11" bell for greater projection and a full, dark sound. Steve, our brass manager is more than happy to answer any cornet related queries that you might have, feel free to contact him via our contact form or leave a comment below.